We’re still analyzing data for our annual State of the Market Report which will be released soon. It’s always interesting to pull the stats and look at the story the numbers tell us, without a preconception of what they should tell us. Because we are in the business full-time and experience real estate on a day to day basis, it’s impossible not to have some assumptions about what the data may contain. That’s probably normal and healthy, however we really try to step back and let the data tell the story. Let’s start out by telling you what’s involved in getting this data. We pull data from two MLS’s, Sunshine MLS and the Realtor Association of Greater Fort Myers and the Beach. Sunshine contains a lot of data for Bonita Springs, Estero, and some in San Carlos, while Greater Fort Myers primarily serves all of Lee County. Companies and agents can belong to one or more MLS’s and enter listings and sold data into either, or both. We find this data more useful and even more comprehensive than official numbers that are reported, but getting this data is cumbersome and time consuming. After it is acquired, it must be scrubbed because there can be duplicates by agents who enter into both boards. We also identified a few listings that were reported as closed but never recorded with the county, so we discard that sale. It’s also amazing to see how listings can be two different prices in the various MLS’s, so we check those against official public records. When we’re done, we believe we have the most tight and comprehensive data available. Each year we publish the annual State of the Market Report. We try to deliver this in an easy to understand format and explain what is really happening in the market. We cannot publish all the data as it would be too large and not understandable, so we break it down to make it easy to read and informative. We’re not done analyzing this data, but we can report a few facts that stand out. If you read this article on a regular basis, you know that we’ve been reporting sales are at record levels and many are selling at or above full price. We know this from our personal experience, but we were astonished to learn how prevalent this is statistically. In 2009, 8,051 homes sold at or above Full Price. That is almost 48% of all homes sold in MLS selling at full price or better, which is simply mind boggling. The reason homes are selling at full price or more is because so many are distressed sales, a new phenomenon to SW Florida in the last few years. 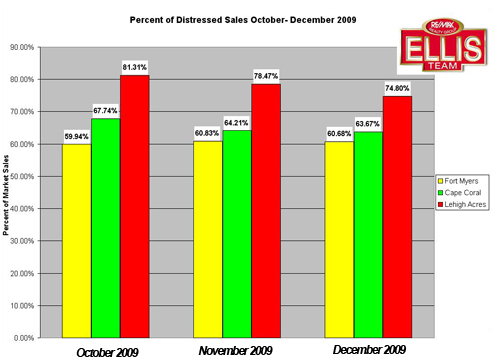 In fact, in December of 2009, 63.78% of all home sales in Lee County were distressed sales. We’ve added a chart that shows the percentages of distressed sales for the last 3 months by area. As you can see, Lehigh Acres leads the way in distressed sales followed by Cape Coral, then Fort Myers. Distressed sales percentages are falling, which is good news. Each month you hear that home prices are down vs. last year. We believe that is about to change. Soon you may start hearing that prices are up over last year. Prices fell somewhat in 2009 but began rising the 2nd half of the year and are close to where they were at the beginning of 2009. Barring unforeseen circumstances, headlines should read price gains going forward. Banks tell us to get ready for more rounds of foreclosures coming to the market. How many remains to be seen, but the banks we deal with directly say they are coming. The good news is our market to date has proved its ability to absorb this inventory. If it’s a deal, the market is ready. What happens when distressed inventory dries up and it’s no longer a deal? Stay tuned and watch for the annual State of the Market Report which will be released soon at www.topagent.com which may help answer some of these questions.